From hooligan Tsars to Soviet heroes and beyond: a brief history of Russian London. An estimated 400,000 Russians now live in the UK’s vibrant capital London. The community is so large that the city has been nicknamed ‘Londongrad’ and ‘Moscow on Thames’. You no longer need to fly to Moscow to experience Russian culture. Russian cafés, cultural centres, language groups, galleries, bookshops, business clubs and ballet schools are springing up in London. Everything from Russian poetry readings and conceptual art to vodka tasting is available. But Russia’s influence on London is nothing new. This article, which is the first in a series of explorations of ‘Russian London’, retraces some of the historic highlights. Past Russian visitors to London included Peter the Great, whose entourage – like a modern-day rock band – virtually destroyed the riverside mansion they stayed in. Novelists like Fyodor Dostoevsky and Lev Tolstoy visited London in the 19th century and Vladimir Lenin spent many years here in the early 20th century, hanging out in Clerkenwell, making his revolutionary speeches. A plaque at Percy Circus near King’s Cross marks one of the places he stayed. Many Russian envoys left their mark on London. The ancestors of the fish-guzzling pelicans in St James’s Park were originally a present to Charles II from Tsar Alexei (Peter the Great’s father), via a late 17th century Russian ambassador. Subsequent ambassadors have included some of Russia’s most resonant family names: Naryshkin, Smirnov, Stroganov as well as Count Semyon Vorontsov (Woronzow was the original spelling of his name), who was ambassador for two decades from the 1780s and a peacemaker in the Russo-Turkish war. He liked London so much he stayed on for the rest of his life and is buried in St Mary Le Bow. There is a street named after him, Woronzow Road, near Primrose Hill. Czar Street in Deptford, now a crescent lined with council flats, is so named because of Peter the Great’s visit there in 1698. The young Tsar, drawn to Holland and England by his passion for shipbuilding, moved from his lodgings off the Strand to Sayes Court in Deptford near the Thames. He sublet a mansion there from John Benbow, a naval officer made famous by Robert Louis Stevenson’s “Treasure Island” (the tavern where the story starts is called the Admiral Benbow). The mansion was actually the home of the famous diarist John Evelyn. Peter’s men proceeded to wreck the house during their three month stay; they covered the carpets in ink and grease, shot at the pictures, burned the chairs and pushed each other in wheelbarrows through the ornamental hedges that were Evelyn’s pride and joy. The housekeeper wrote to Evelyn to complain of ‘a house full of people right nasty’. Architect Sir Christopher Wren was called in to survey the damage after they had gone which he estimated to be around £250. An inventory of the garden reported: ‘During the time the Zar of Muscovie inhabited the said house, severall disorders have been committed in the gardens … the grasse is … broke into holes by their leaping and shewing tricks upon it’. Today, the grass in diminutive Sayes Court Park, is all that is left of the garden. It flourishes once again, but around a gnarled and spreading mulberry, unkempt rosebushes and several stately plane trees. In Rotherhithe, a short distance north along the meandering Thames, the willows of the ‘Russia Dock woodland’ grow on the site of a former dock, closed and filled in the 1970s. Until then, huge boats carrying timber from Russia used to arrive here along the river. The wall of the old dock can still be seen near an attractive ecological garden, full of purple loosestrife and baby moorhens. On the riverbank to the east of Sayes Court Park, an unusual monument by sculptor, Mikhail Chemiakin, recalls Peter the Great’s visit. The Tsar stands on a platform flanked by canons, between a throne and a laughing, imperial dwarf, looking out across the wide Thames that drew him to the city. Peter also visited the Royal Observatory at Greenwich and the Arsenal at Woolwich, now one of the world’s oldest military museums. The ancient Tower of London with its Royal Mint and the nearby St Katherine’s Docks, now a picturesque oasis in the city, appealed to him. There’s no trace of the pub he drank in on Great Tower Street – the landlord is supposed to have renamed it the ‘Czar’s Head’ in Peter’s honour – but there is a Muscovy Street opposite the Tower of London. 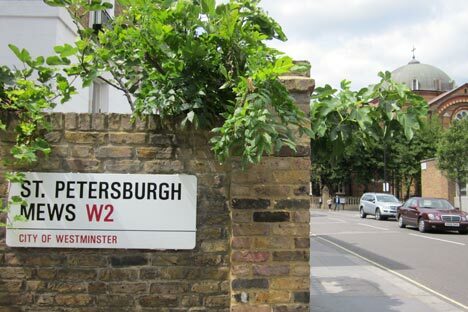 A host of other Russian road names, including St Petersburgh Mews and Moscow Place, sprung up in the Bayswater area to commemorate Tsar Alexander I’s visit to London in 1814, along with the ornamental Russian eagle which graces nearby Orme Square. A statue in the grounds of the Imperial War Museum pays tribute to the 27 million Soviet casualties of World War II. Built in 1999, the memorial is of a stylised figure with its head bowed below a bell. A Victory Day commemoration was held there on 9 May. A new statue of Yuri Gagarin, the first man in space, has just been unveiled outside the British Council on the Mall by his daughter Elena Gagarina, director of the Kremlin Museums. The Russian Space Agency gave the statue to the British Council to celebrate the 50th anniversary this year of the first human space flight. The British Council is showing an exhibition of the life of cosmonaut Yuri Gagarin showing items from the space programme such as the first space suit, space food and one of the earliest dog space suits. It is on until 13 September. In an interview in April, Gagarina said of her famous and charismatic father: ‘I know that he liked Britain very much!’…‘The Queen gave him some rather beautiful dolls to bring back for me and Galina’. Indeed, the British royal family provide yet another point of connection between the two countries. As Sergei Sayenko from the Radio Station The Voice of Russia pointed out on the Queen’s birthday this year, they are ‘relatives of the Russian Romanov dynasty.’ These links and others, including the new exhibition of Royal Faberge at Buckingham Palace, will be covered in our next feature exploring Russian London.